Said Abu Hijleh, DAI Country Director in Palestine, is an executive manager and private enterprise development specialist with more than 25 years of experience building economic resilience and creating market linkages for the West Bank and Gaza. 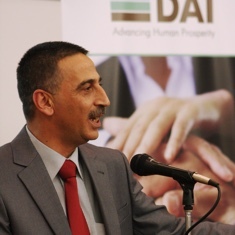 Since 1996, Said has been a trusted employee of DAI having served on five large private sector development projects funded by the U.S. Agency for International Development (USAID) and as the Chief of Party on two flagship programs—the USAID Palestinian Enterprise Development Programme (PED) and the Market Access Programme (MAP). He was later appointed as the Country Director for DAI Palestine, leading strategic business ventures in the region. Said has managed programs for a range of donors such as the World Bank, USAID, the U.K. Department for International Development, and the United Nations Development Programme. In his roles as COP and Country Director, Said led private sector programs to increase the competitiveness of Palestinian companies in various service and manufacturing sectors. His experience advising both the private and the public sector has resulted in improved market linkages for strategic industries, including ICT, the olive oil industry, tourism, security services, and stone and marble. Said has an unparalleled understanding of the development, political and business climate issues in the West Bank and Gaza having worked in the private sector and donor programs in the region since 1990.